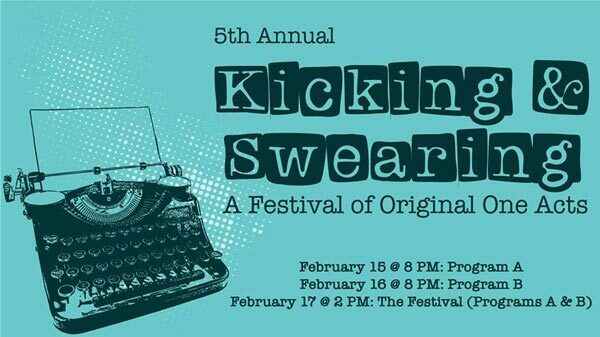 (RAHWAY, NJ) -- The Fifth Annual Kicking & Swearing One-Act Festival will take place from February 15-17 at the Union County Performing Arts Center’s Hamilton Stage. It's a weekend filled with original one-act plays by the most talented budding writers and directors in the theater world. The festival offers two evenings of insightful writings that include original comedy, tragedy, satire, and sci-fi short plays to make up a matinee of spectacularly exciting theater. The first group of selected plays will be performed on Friday, February 15 at 8:00pm, and the second group will be performed on Saturday, February 16 at 8:00pm. The Sunday matinee, February 17 at 2:00pm, will present all selected plays, followed by a Q&A session with the writers, directors, and cast. General admission tickets are available for purchase for $15 or $20 at www.ucpac.org/events. Tickets may also be purchased by visiting the Main Stage Box Office located at 1601 Irving Street in Rahway, NJ. The Box Office can be reached via email at boxoffice@ucpac.org or by calling 732.499.8226. The Hamilton Stage is located at 360 Hamilton Street in Rahway, NJ and both locations are easily accessible to major roads and public transportation. Scroll down for a list of the plays.